Directorate of Town & Country Planning, Dibrugarh. 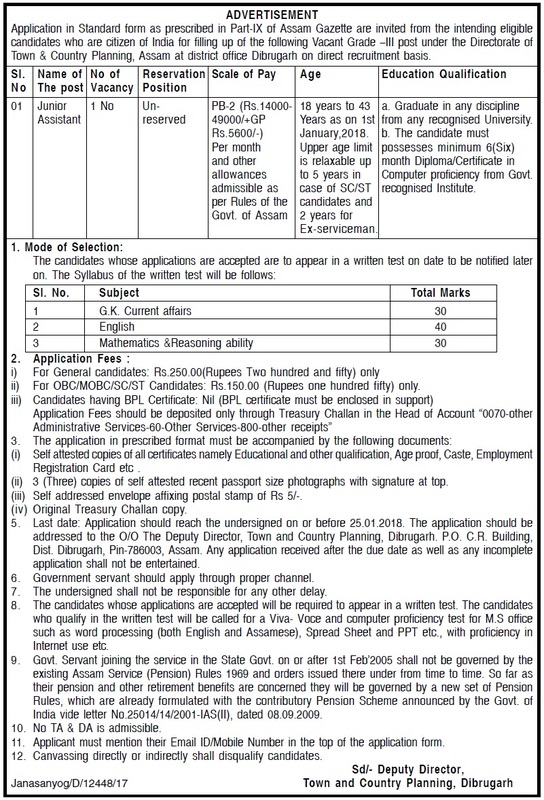 Application in Standard form as prescribed in Part-IX of Assam Gazette are invited from the intending eligible candidates who are citizen of India for filling up of the following Vacant Grade –III post under the Directorate of Town & Country Planning, Assam at district office Dibrugarh on direct recruitment basis. Age: 18 years to 43 Years as on 1st January,2018. Upper age limit is relaxable up to 5 years in case of SC/ST candidates and 2 years for Ex-serviceman. a. Graduate in any discipline from any recognised University. b. The candidate must possesses minimum 6(Six) month Diploma/Certificate in Computer proficiency from Govt. recognised Institute. ii) For OBC/MOBC/SC/ST Candidates: Rs.150.00 (Rupees one hundred fifty) only. (i) Self attested copies of all certificates namely Educational and other qualification, Age proof, Caste, Employment Registration Card etc . (ii) 3 (Three) copies of self attested recent passport size photographs with signature at top. (iii) Self addressed envelope affixing postal stamp of Rs 5/-. (iv) Original Treasury Challan copy. Last date: Application should reach the undersigned on or before 25.01.2018. The application should be addressed to the O/O The Deputy Director, Town and Country Planning, Dibrugarh. P.O. C.R. Building, Dist. Dibrugarh, Pin-786003, Assam. The candidates whose applications are accepted will be required to appear in a written test. The candidates who qualify in the written test will be called for a Viva- Voce and computer proficiency test for M.S office such as word processing (both English and Assamese), Spread Sheet and PPT etc., with proficiency in Internet use etc. Applicant must mention their Email ID/Mobile Number in the top of the application form.